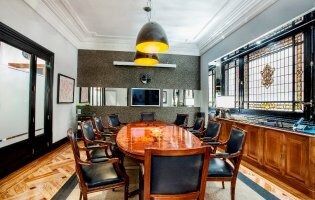 Exclusive Meeting Room Rentals by the Day/Hour. Emblematic Meeting Room Rentals for your meetings, interviews, presentations, work breakfast, etc. Completely equipped with the latest technologies. Support from our Secretarial Staff throughout your meeting from 9:00 a.m. to 8:00 p.m.
>> Audiovisual Aids: TV monitor, video projector, DVD player, Polycom telephone for audio conferences, flipchart white board. >> Multi-function equipment with a digital printer, fax machine and scanner. >> Free access to 300 MB fiber optic Internet/Wi-Fi. >> Personalized and confidential visitor service. >> Mineral water, coffee, tea and stationary. >> Coffee-break, lunch & catering service. >> Administrative services with passes by the hour, for a fixed monthly cost or for specific jobs. – Exclusive and personalized attention of your visist. Our Executive Secretaries will personally handle your calls, visitors and administrative tasks during your meetings.